Going into the GUI and creating a scheduled task is not rocket science, and now, either is creating a scheduled task via PowerShell. 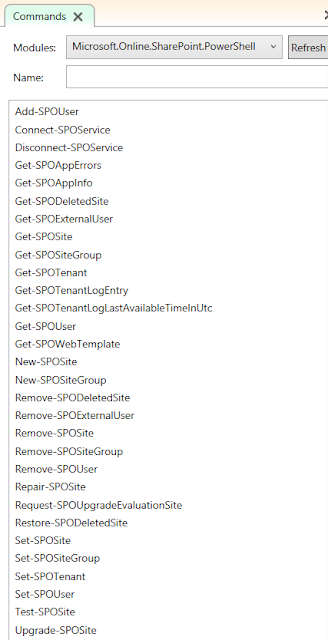 There is now a ScheduledTasks PowerShell module to help with automating this task. 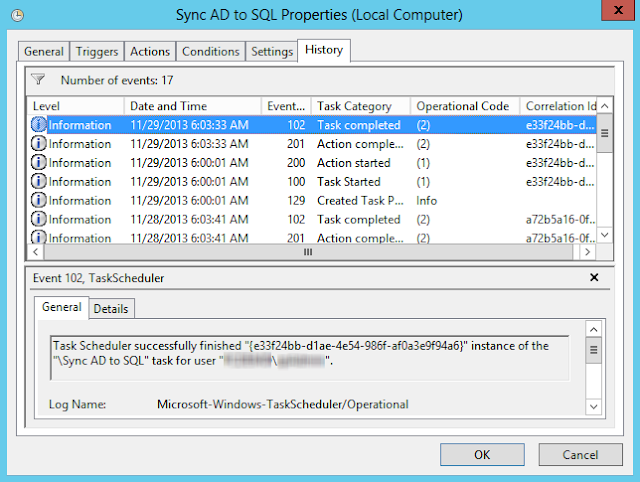 Below is a script for creating a Scheduled Task named Sync AD to SQL. 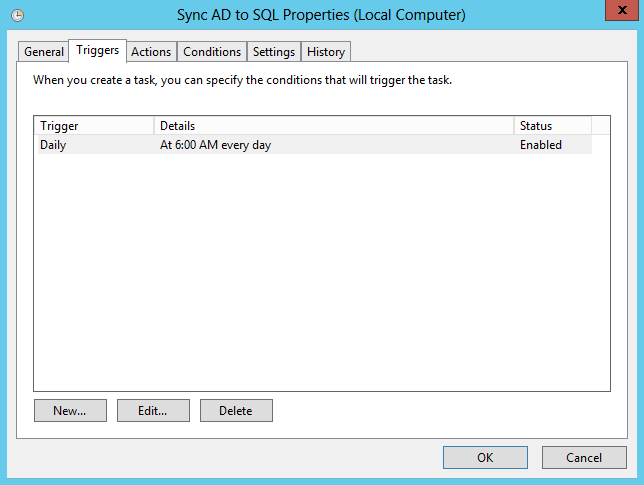 The task runs daily at 6:00am and executes a PowerShell .ps1 file name Sync AD to SQL.ps1. 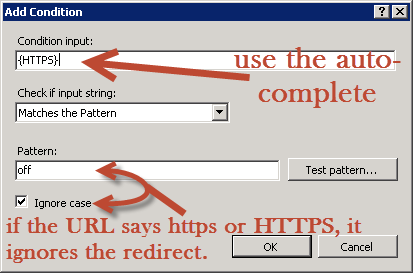 This task is run as a specific domain user. 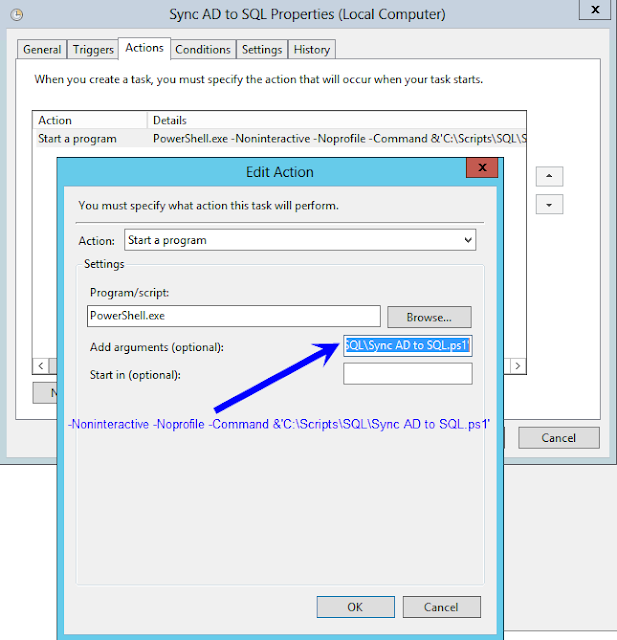 $taskName = "Sync AD to SQL"
$fileLocation = "C:\Scripts\SQL\Sync AD to SQL.ps1"
$argument = "-Noninteractive -Noprofile -Command &'" + $fileLocation + "'"
One of the big complaints about querying Active Directory from within SQL is the lack of ability to easily return more that 1,000 items. In this post, we are going to solve that dilemma by throwing in some PowerShell to get around the Page Size limit. 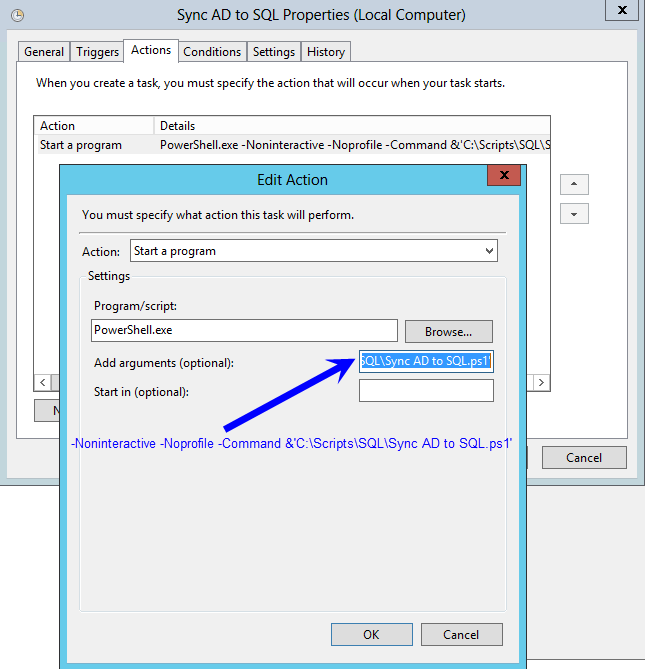 In this blog, I will demonstrate how to take 28,000+ users from Active Directory, put them into a SQL Table, and update the Production SQL Table. I will also go through some of the lessons learned from this experience, because it was not as easy as I had originally had hoped. 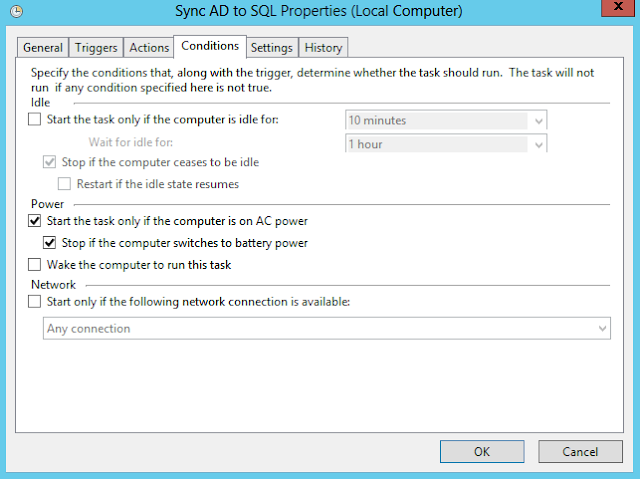 Why synchronize AD to SQL? From a user manageability perspective, I think this is a great way to allow users to maintain their own information, such as their Address and Phone Numbers, or any corporate information without bothering HR or the IT staff to update AD profiles. 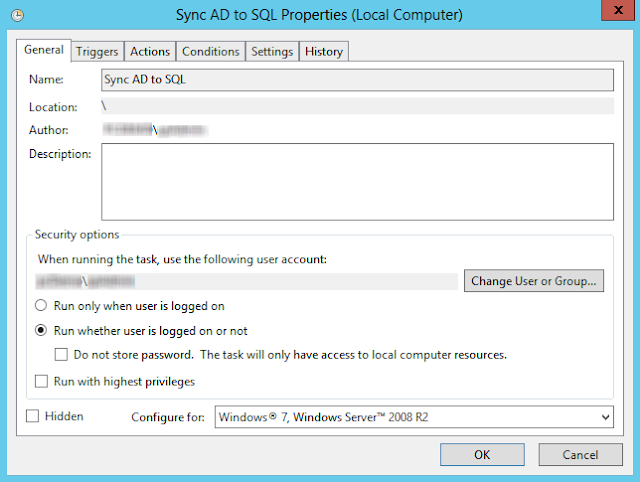 The objective of this post is to take all users from Active Directory, along with their lastLogon times, and synchronize them into a SQL table. This is going to be accomplished through the use of PowerShell and SQL. 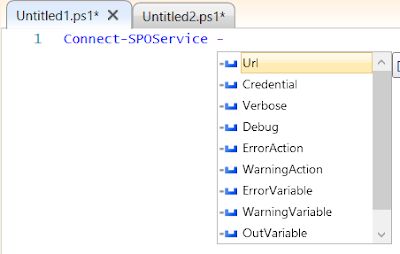 We will go through the -Filter and -Properties parameters later in this post. 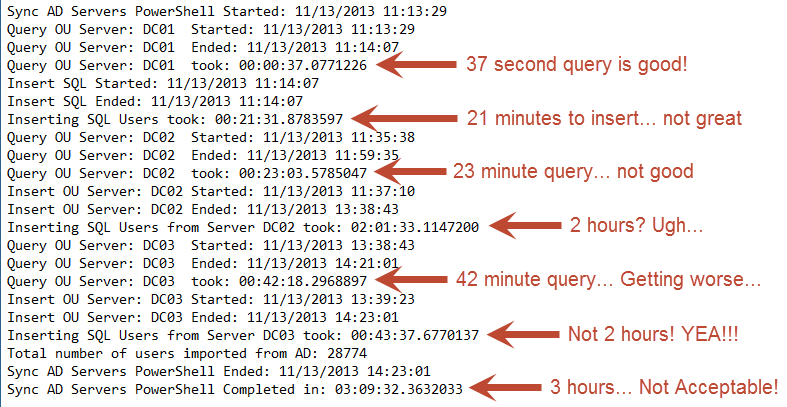 Do not take querying your servers lightly. 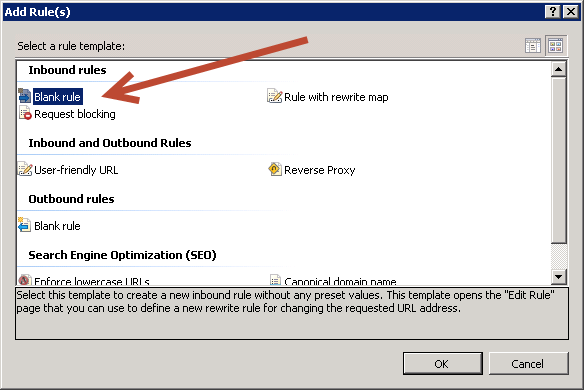 You should talk to your AD team BEFORE querying your domain controllers, and see if they have a preferred server that they wish you to query and/or specific times that they wish you to run your queries. 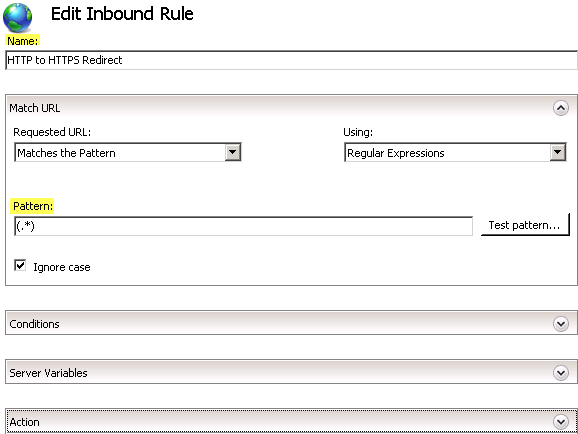 Obviously, if they do not want you to query each server, then you will not be able to get accurate lastLogon times. Also, this information could be important to them as a health check of their servers. Now that you have your User Information, we will be manipulating the information and passing it into SQL. 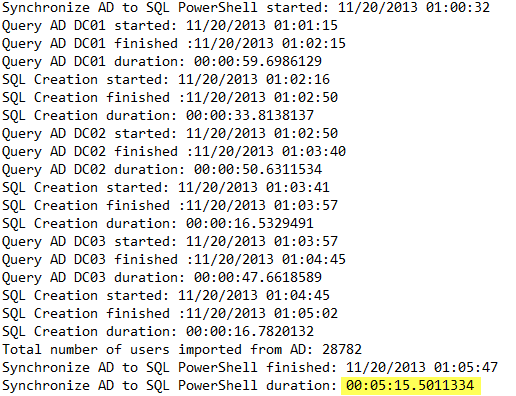 As in the previous post, I started by creating a table in SQL called Temp_ADUsers. 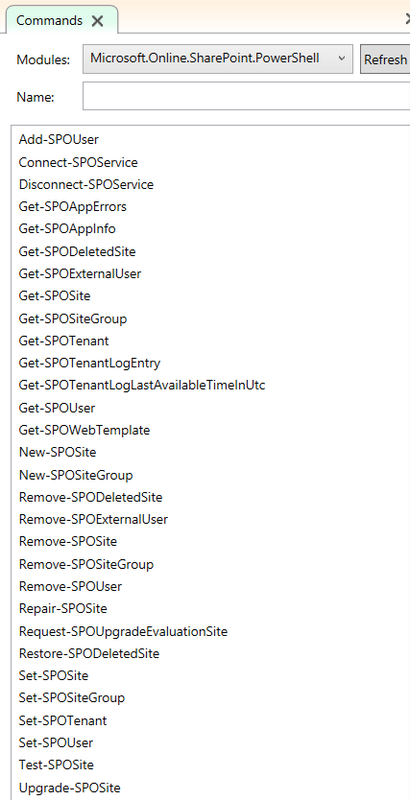 Since we are now able to write a SQL query within PowerShell to insert information into SQL, I figured I would just loop through each individual user and insert them and their information into my table. 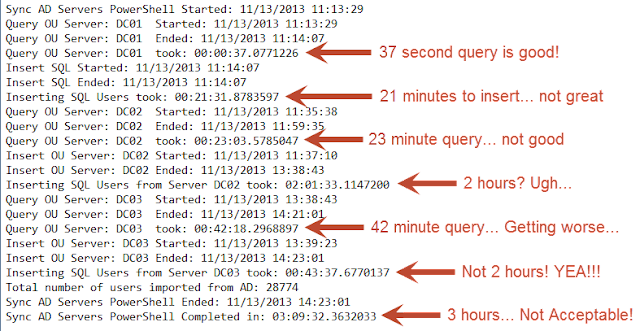 Then I would query the second OU and update the table with each user's lastLogon time, and then the final server. Invoke-Sqlcmd -query $query1 -database "pcDemo_Personnel" -ServerInstance "sql2012-03"
Because there are people in Active Directory with single apostrophes in their name like Mr. O'Connor, I would have to come up with a work around for any property value that has an apostrophe in it. Luckily, the time to completion is so horrible that I figured solving for an apostrophe should be pretty simple and will address this issue at a later date. The short lived Attempt #2 was based off a multiple item insert so that I could get rid of the foreach loop. It was a short lived idea because you can only bulk insert up to 1,000 items into SQL. Then I started looking into SQL's Bulk Insert Query, which led me to a question posed in StackOverflow, which led me to the Hey, Scripting Guy! 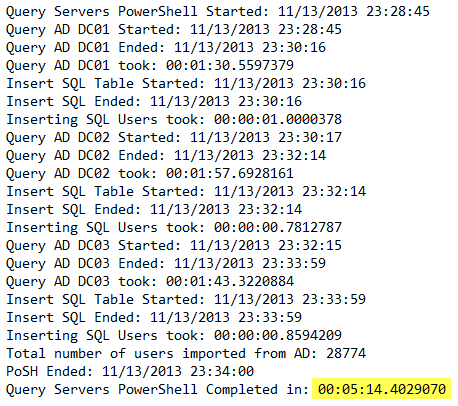 Blog titled Use PowerShell to Collect Server Data and Write to SQL. After reading both articles, it became evident to me that every Server or Network Administrator now has the ability to take Enterprise Information and dump it into SQL. In my opinion, THIS IS HUGE!!! Thank you again Chad Miller (@cmille19) for creating and sharing your SQL Functions! Holy COW look at those numbers! This process saved 3 hours, 4 minutes, and 18 seconds! Now that we are able to load User data into SQL, it is time to put the rest of the script together, like Drop the Temp Tables, Set the Get-ADUser -Filter, and move the data from the Temp Tables into the Master AD Users Table. Because the functions that create the SQL data tables do not automatically check to see if the tables exist before creation, it is necessary to delete existing tables so that we can import the data from AD. $query1 = "IF OBJECT_ID('dbo.$tableName', 'U') IS NOT NULL DROP TABLE dbo.$tableName"
Since I had to put a zero in for null values for the lastLogon time, it is necessary to clean up the table. Luckily it is pretty easy to set all 0 values back to null. $query2 = "UPDATE [dbo].$tableName SET lastLogon = NULL WHERE lastLogon = '0'"
$tempTableName = "temp_" + $OUs + "_Table"
$columnName = $OU + "_lastLogon"
$query5 = "ALTER TABLE temp_lastLogonTimes ADD " + $columnName + " varchar(1000)"
temp_" + $OU + "_Table"
WHERE temp_lastLogonTimes.sAMAccountName = temp_" + $OU + "_Table.sAMAccountName"
Now that the temp_lastLogonTimes table has the lastLogon times for each user from each Domain Controller, it is time to compare the times and find the true lastLogon time. To accomplish this in PowerShell, we will query the new temp_lastLogonTimes table, add a column for the lastLogon time to the temp_lastLogonTimes datatable, compare values, and update the row. $str_OUs += "ISNULL(" + $OU + "_lastLogon, 0) as " + $OU + "_lastLogon"
$str_OUs = $str_OUs -join ", "
$query8 = "SELECT sAMAccountName, " + $str_OUs + " from temp_lastLogonTimes"
$arrayLLT | Add-Member -MemberType NoteProperty -Name "lastLogon" -Value ""
Like before, we will take our datatable, create a final temp table in SQL, and move the data to the production table. WHERE LOWER(temp_lastLogons.sAMAccountName) = LOWER(" + $activeTableName + ".UserLogin)"
So based off the data above, there is a run time average of approximately 1.75 minutes per DC queried when dealing with 28782 users. 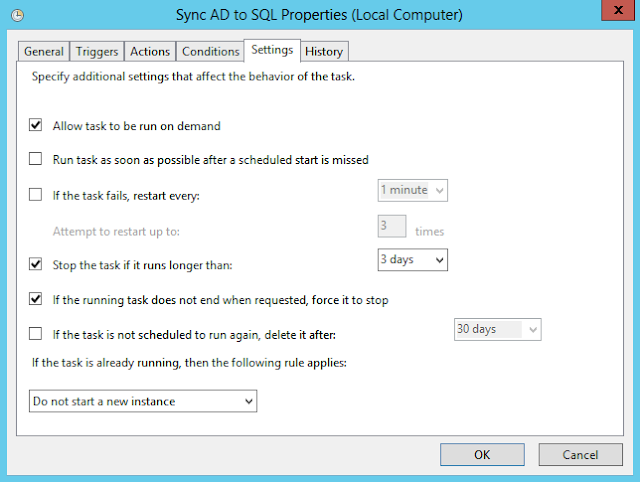 Now that we can synchronize all users from AD into SQL, we need to create a scheduled task to run our PowerShell script to keep SQL synchronized on a regular basis. Now, this can be run daily or every couple of hours pending on how your organization works. 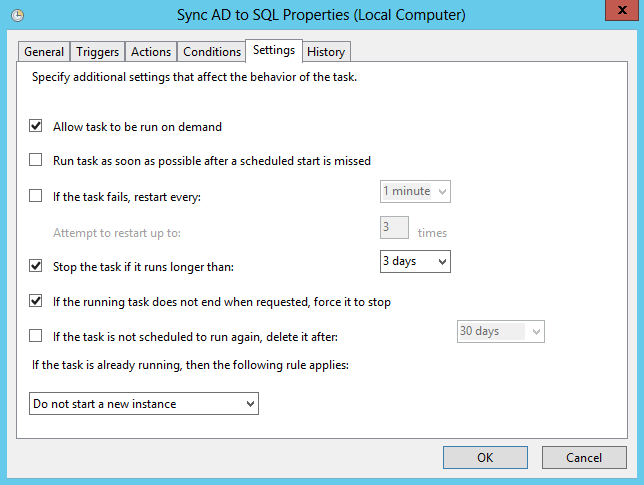 Please review my post on Creating a Scheduled Task With PowerShell. 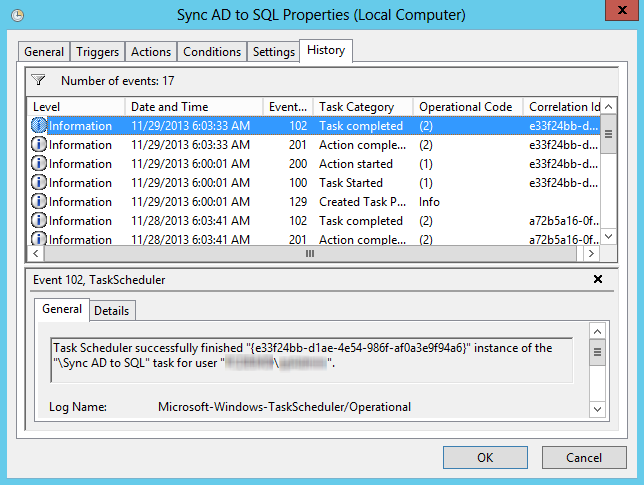 11/29/2013 Added link to Creating a Scheduled Task Blog, and added more kudos to Chad Miller for his contribution of the SQL Functions. One of the great things about my job is that I get to spend a bunch of time solving puzzles and fixing peoples' problems. I get to install SQL Server and SharePoint in existing, well established Federal environments. Incase you are unaware, in a segregated, secured environment, such as a Federal Agency, the left hand does not always talk to the right hand. The DNS team works apart from the Exchange Team, who works apart from the AD team, who is isolated from Network Ops team, who works independently from the firewall team, and so forth. Getting things accomplished in such an arena, can be challenging, and usually involves a vertical assent and decent approach, meaning I talk to my counterpart, they talk to their boss, who talks to, for example the AD Team's boss, and then my service accounts get created. 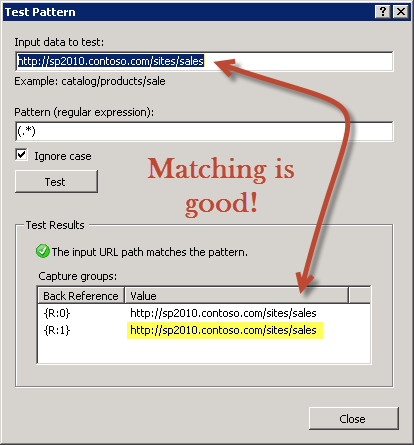 I was working with a group out of Alaska and Seattle, WA, to get a SharePoint 2010 Enterprise environment with SQL Server 2008R2 up and running after the group finished a domain migration. 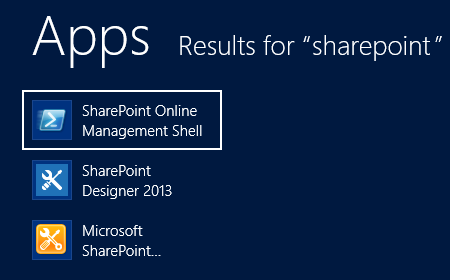 As with any SharePoint Farm installation, I installed SQL first. 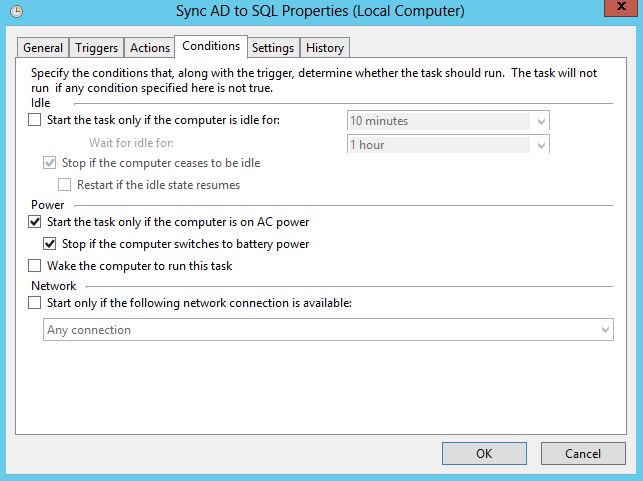 Everything seemed to have installed correctly, however after reboot, the SQL Server instance and the SQL Agent instance would not fire up, as seen in Figure 1. 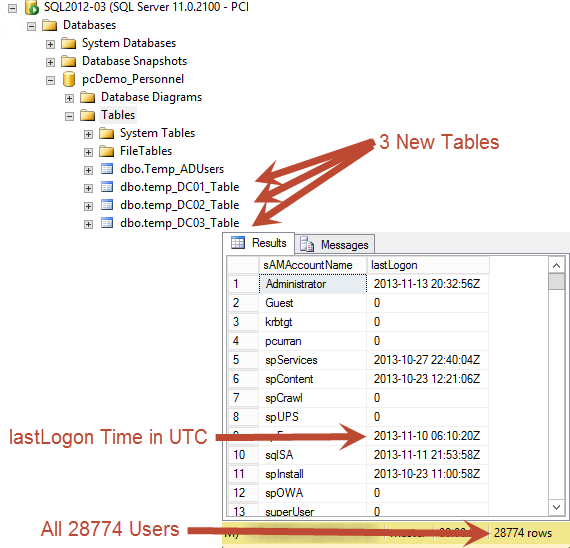 Figure 1: Showing the stopped SQL Server and SQL Agent accounts. In the process of troubleshooting, I opened up the service instance for the SQL Server Service and verified that the password was correct. As seen in Figure 2, after entering the account password, I was greeted with a message. 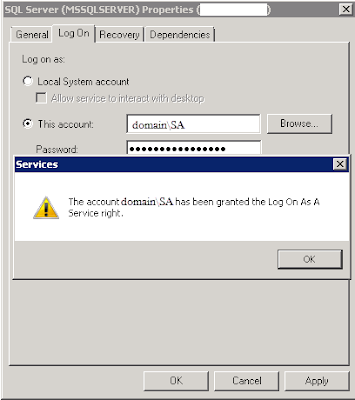 Figure 2: Shows that after entering the account password, that the account has been granted the Log On As A Service right. This pointed me in the right direction for the first problem in this environment. 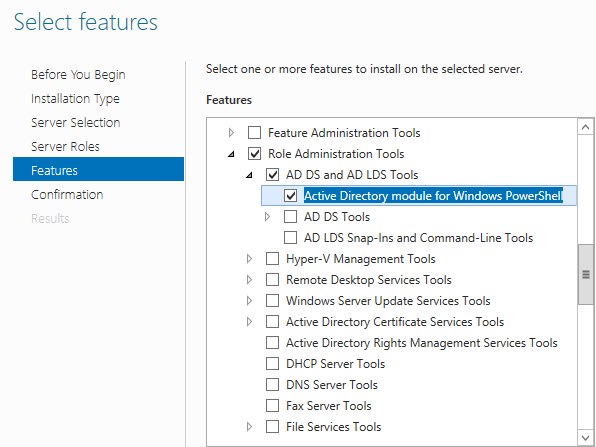 The service accounts that were created in Active Directory (AD) had a GPO rule that new accounts could not Log On As A Service. The new accounts were put into a new Security Group, ran a gpupdate /force (http://technet.microsoft.com/en-us/library/bb490983.aspx), rebooted the server and SQL was now able to be rebooted successfully and have the service instances come up running! Unfortunately, placing all the service accounts into the new Security Group did not stop all the issues within the Farm. 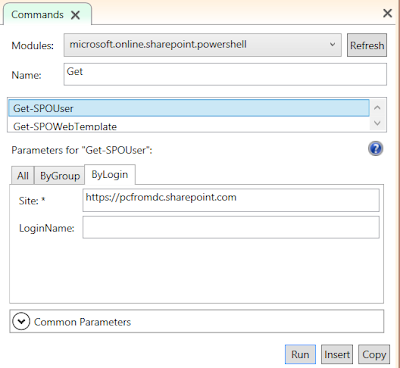 SharePoint installed correctly, and Central Administration(CA) provisioned and started correctly, however, after rebooting the server, I would receive a 503 error when trying to get to CA. Typically you would receive a 503 error when the Application Pool Account for your site has been stopped. 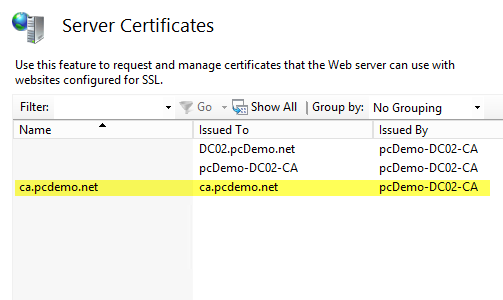 After manually starting the account and clicking on the CA link, I would get a 503 error and my Application Pool Accounts would be stopped again, as seen in Figure 3. 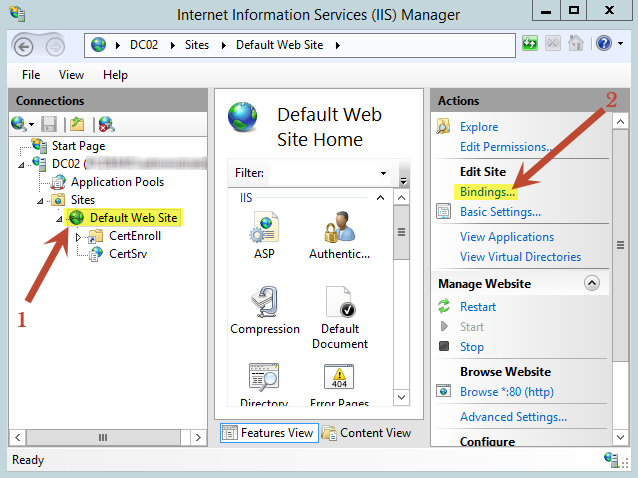 Figure 3: After browsing through the IIS sites, the Application Pools would stop. 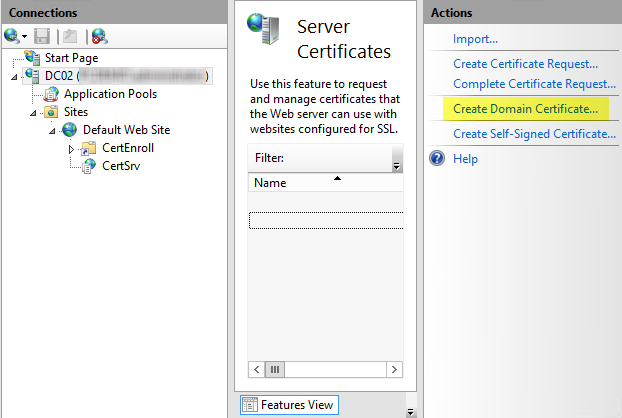 The identity of application pool SharePoint Central Administration v4 is invalid. The user name or password that is specified for the identity may be incorrect, or the user may not have batch logon rights. If the identity is not corrected, the application pool will be disabled when the application pool receives its first request. 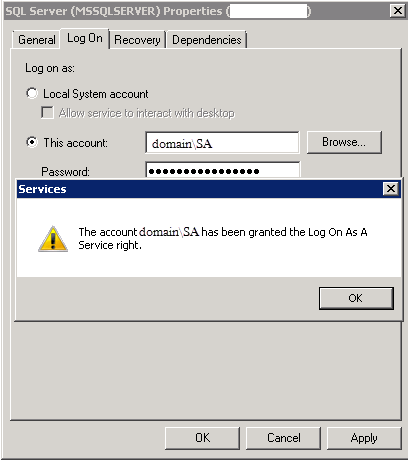 If batch logon rights are causing the problem, the identity in the IIS configuration store must be changed after rights have been granted before Windows Process Activation Service (WAS) can retry the logon. If the identity remains invalid after the first request for the application pool is processed, the application pool will be disabled. The data field contains the error number. 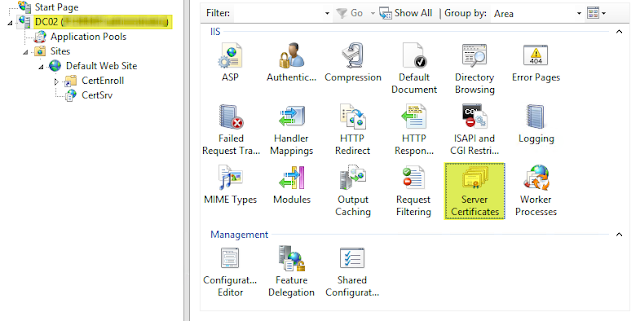 So, after having the security policy modified to allow the IIS_IUSRS to Log On As A Batch Job, we ran a gpupdate /force, rebooted the server and the IIS Application Pool was able to stay up and running after trying to access Central Administration. Recently, while working with a customer, I ran into interesting issue with my content service account (eg: spContent). I was able to provision my farm, create all of my service accounts, and create my Web Application and Site Collection. I was able to open Central Administration, however, when I tried to browse to the Site Collection URL, I would receive an error. It was a bit odd that everything else worked, but the web page would not render. Now, I was in an environment known for having issues with GPO and had a bunch of devices in the background doing all kinds of packet inspection, so I was a bit hesitant as to what could be the error. This article basically asks to make sure that Impersonate a client at authentication has local rights. 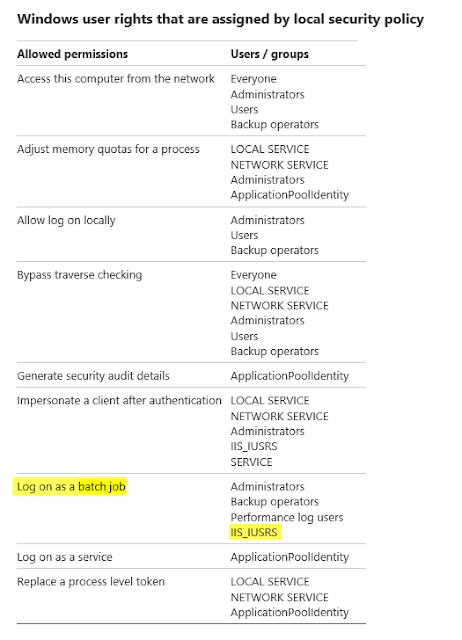 Make sure your Service Accounts can Log On As A Service and that your IIS_IUSRS are allowed to Log On As A Batch Job. You might need to have the Impersonate a client at authentication has local rights as well. Make sure that you do an iisreset after you push your GPO updates (or reboot the server(s)). While doing some work for a client the other day, I needed to reverse engineer how many users can their farm handle based on the results from a Visual Studio Load Test. Determining the requests per second that the users will generate is easy once you plug in the required information based off of the end users' usage profiles. Great! According to the spreadsheet, their web server needs to be able to handle around 208 requests per second. But if you run a load test on their farm, and you are given an Avg RPS, how many people can your farm handle based off the give utilization statistics? This was a bit harder to figure out, but eventually I got there. After plugging in the actual Avg RPS that the farm could handle while the hardware was still in it's "Green Zone" was 11. When you put that into the spreadsheet, the number of Total Users that should access their environment should be less than 1,320.